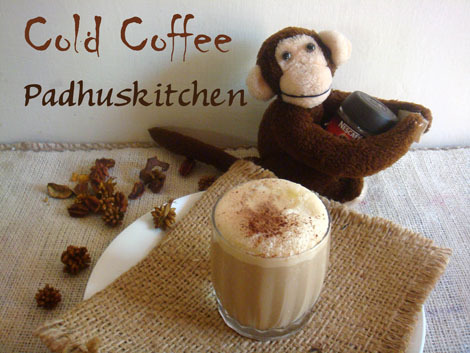 For all coffee lovers out there, here is a another cool recipe with coffee to beat the summer heat. Cold coffee with ice cream is sure to refresh you. Today let us learn how to prepare Cold coffee. If using instant coffee powder, dissolve it in 3 tbsp of warm water. Leave it to cool. Blend milk, coffee decoction, powdered sugar and vanilla ice cream till frothy. lovely coffee and lovely picture! Reminds me of college days when my friend made them for me.Looks delicious. I love coffee but have nvr tried cold ones with ice cream..!! want to try this one! Great for the scorching summer in India..
Looks Yummy! can't wait to try it out. Very refreshing.. looks inviting !! great for summer. love that monkey on side holding coffee, it makes me laugh. would love a glass of it! Wat a droolworthy cold coffee, seriously need it rite now.